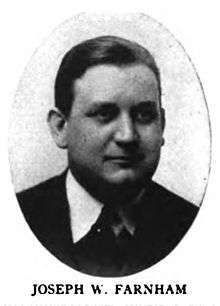 Joseph White Farnham (December 2, 1884 – June 2, 1931) was an American playwright and a film writer and film editor of the silent movie era to the early 1930s. He was also a founding member of the Academy of Motion Picture Arts and Sciences. He was born in Connecticut. Farnham got his start in film through his business relationship with theatre empresarios Gustave and Daniel Frohman who owned The Frohman Amusement Corp.. The Big Parade is probably the most famous of his works adapted to film. In the 1st Academy Awards of 1929, nominees could be considered for an Oscar for an award on the basis of multiple films within the year. Joseph won his Best Writing - Title Cards award for the films Fair Co-Ed; Laugh, Clown, Laugh; and Telling the World. This was the only year that an Oscar for title cards would be awarded. Joseph Farnham has the unfortunate distinction of being the very first Academy Award-winner to die. He died of a heart attack while living in Los Angeles, California and was interred in the Forest Lawn Memorial Park Cemetery in Glendale, California.